Semi automatic volumetric liquid filling machines are two head, table top, fully GMP model used to fill variety of liquids. This machine works on the volumetric principle and is fitted with two syringes on the sides. The volume of the machine can be easily adjusted by increasing or decreasing the eccentricity. Motor and gearbox of the liquid filling machines are covered in a SS cabinet. 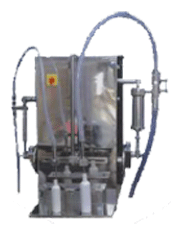 Volumetric liquid filling machines is available in varied dimension and capacities. The machine consists of Reciprocating Filling, Driving type Nozzle, multi dose filling system, PLC control panel, Container Platform, syringe Holders, HDPE Tubes and Piles and on line starter.